FALL RAFFLE Travelers Rest Artists Alliance - Paint. Sculpt. Write. Act. Perform. And Flourish! Fall Bluegrass and Harvest Market at Trailblazer Park in Travelers Rest. Raffle tickets can be purchased on line or at the White Rabbit Gallery until November 29. The drawing will be held on November 30 and winners will be notified by phone. Tickets are $5 a piece or $20 for 5. ​As the President of the Travelers Rest Artists Alliance I am always looking for ways to help support and grow our local and regional arts community. To that end, I am asking for your support in our first annual Fall Raffle. 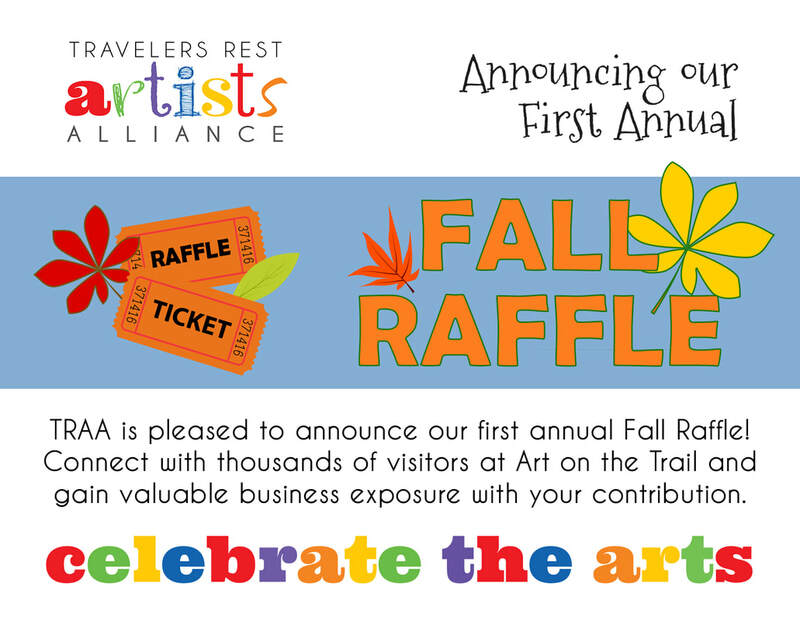 We’ve established the Fall Raffle to coincide with Art on the Trail, our annual fine arts and crafts festival. Each year, thousands of visitors from near and far come to TR for this highly publicized event which boosts our local economy and brings in valuable tourism dollars. With this opportunity, our hope is to sell enough raffle tickets to continue our mission to make the arts an important and accessible facet of daily life in our community and a vital element that will continue to attract tourism dollars year round. As always, I would love to hear from you and encourage you to contact me at traa@ArtinTR.com or by phone at 610.659.4669 to discuss your participation.